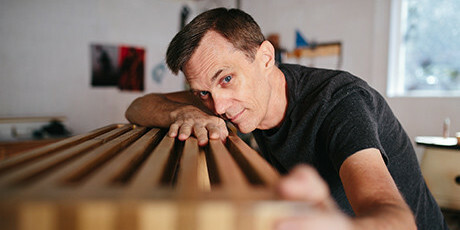 ...the four most common mistakes woodworkers make - and how to avoid the pitfalls that could cost you years of tedious trial and error and tons of wasted money. I've been teaching woodworking on my YouTube channel “Woodworking for Mere Mortals” for over ten years. Millions of people all over the world have watched my videos, and tens of thousands have used my advice to create their first projects. 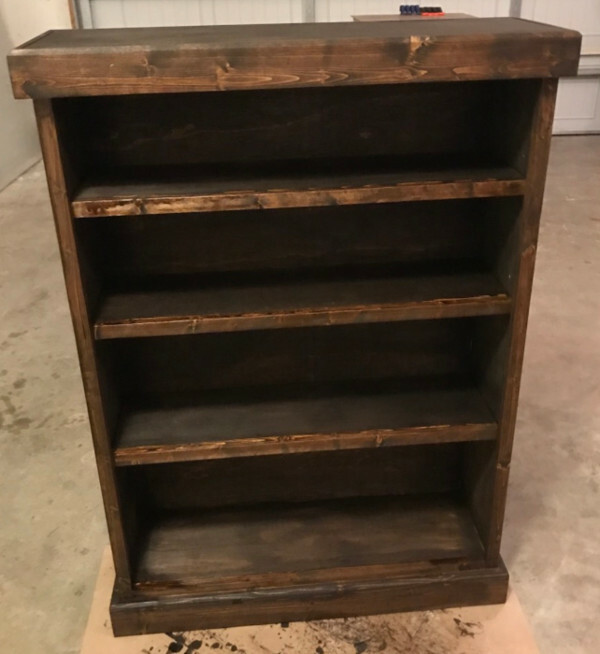 I believe anyone can build unique, practical, beautiful pieces out of wood, and I’m here to tell you that you don’t need fancy tools, a big garage or workshop, unlimited time, years of experience, or a library of plans. 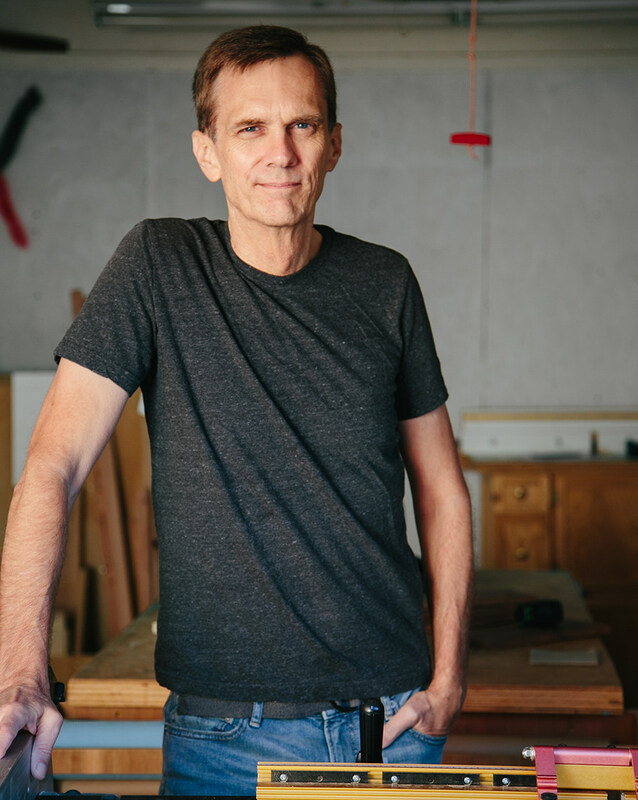 For the Weekend Woodworker, I’ve put my decades of experience into one comprehensive, step-by-step resource. 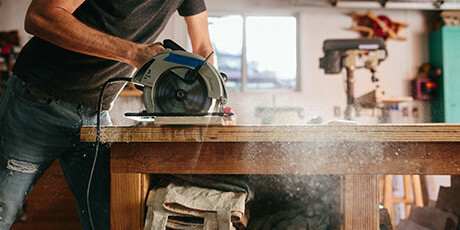 Over 4,000 aspiring woodworkers have already been through the course and showed that it’s perfect for you if you’re just starting out… as well as to refine your core skills and techniques if you’ve been at this for awhile. 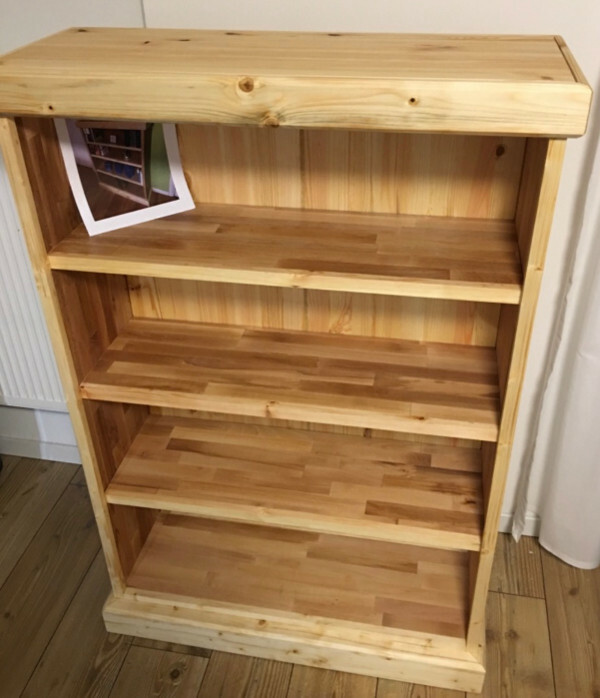 You will be able to build pieces that are unique – tailored to fit your needs and preferences – the kind you won't find at a certain Swedish knock-down furniture store. And just imagine hearing the words, “Wait, you built that? !” and having your family using your creations for decades to come… and saving money in the process! 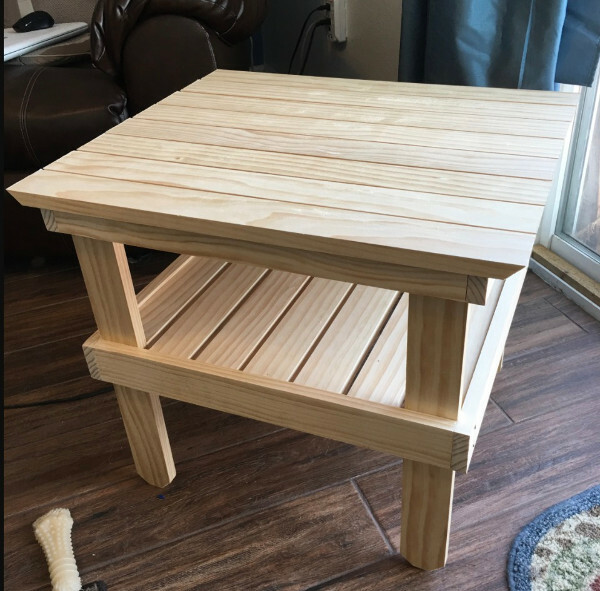 The Weekend Woodworker is the only program of its kind that walks you step-by-step through creating beautiful, practical pieces for your home, office, shop, and patio over a weekend. We’ll cover everything from finding the right materials, to picking the perfect projects to get started, to saving money on tools, to cutting techniques, to joinery, to finishing your project beautifully and in your own style. The lessons are progressive, meaning we’ll start with simpler projects and get more complex as the course goes on and you build needed skills. That means you’ll never be in over your head. I’ve got your back. In my YouTube videos, I don’t get the chance to show every step of a project. (It would just take too long to produce!) Here, you’ll be able to follow me with every step as I explain why I’m doing what I’m doing so no questions will be left unanswered. This is the closest you can get to standing next to me in my shop while I’m building a project. In total you will get six weekend projects, each broken into two in-depth video tutorials. See below for a project by project break-down. Ever started a project only to realize halfway through that you need to go back to the hardware store because they assumed you had a tool you don’t? Not here. If you need it, it’s on the list, including all materials you’ll need. No assumptions made about a “basic workshop.” And the best part is, I’ve kept it to basic woodworking tools only. Anytime I introduce a new tool, I’ll go over how to get the most out of it. There are features hidden in some shop tools that mean even if you’ve owned a particular tool for years, you’ll learn something you didn’t know. And if you’re new to a tool, you’ll be able to use it confidently for the projects by the end of the lesson. 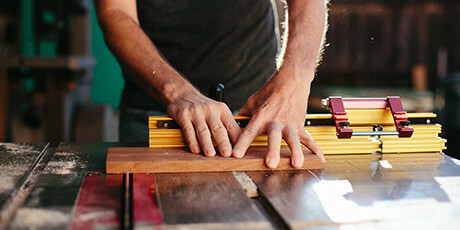 Before we start cutting, drilling, sanding, or building, I’ll walk you through how to do it. I go into detail about what exactly you’ll need to do. No more watching 5 seconds of a YouTube video on repeat to try and figure out the cut. I’ll walk through every step with you and introduce new skills gradually. 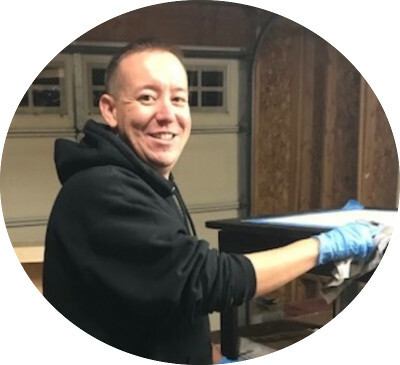 Each of the projects inside the Weekend Woodworker course is designed for you if you’ve never built anything before. I’ll also show you ambitious overachiever types some fun modifications you can make to spice up the design, along with bonus plans and tutorials. Finishing shouldn't scare you! During each week’s lesson, I’ll show you new finishing techniques you can use to take your projects to the next level. 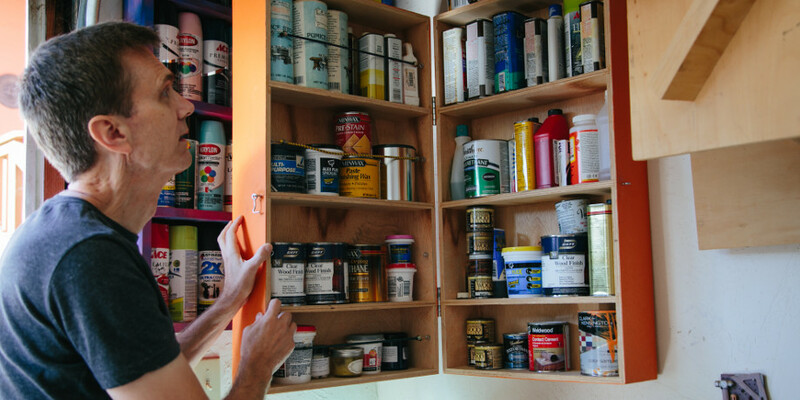 Do away with the billion and one options and get my favorite recommendations for cheap, easy and silky-smooth finishes with just a couple hours per project. Is it too cold to build in your garage right now? Do you have a busy schedule? No idea if you can dedicate the time over the coming weeks? Don’t worry! The Weekend Woodworker has full, lifetime access. Once you’re signed up you can access the course whenever, wherever you like. This means you can work along with me in six weekends or take your time completing the projects at your own pace. If you don’t have time to build projects right now (or it is too cold) simply wait until you're ready and then dive in. California Casual is a laid-back, simple, and fun style with sturdy construction. It often has visible fasteners or exposed pocket screws. 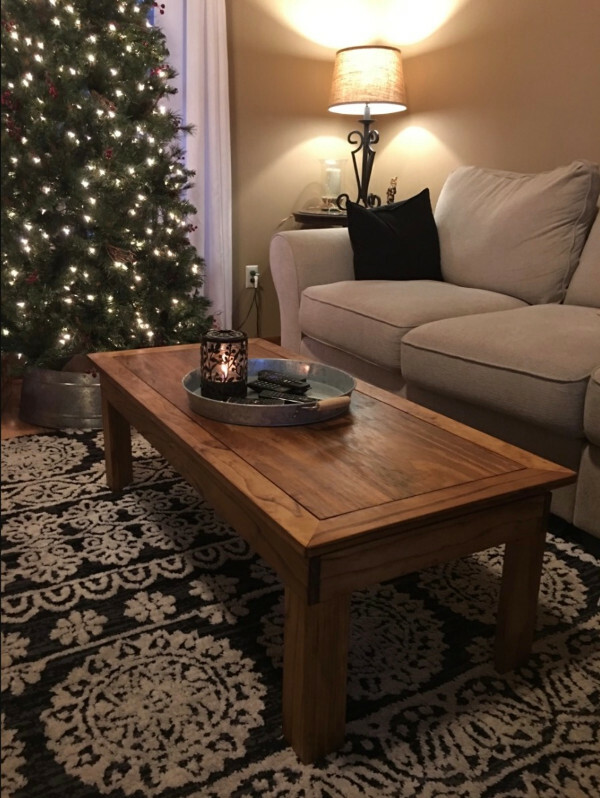 Pieces are usually made from inexpensive pine boards or plywood (which would make some “traditional” woodworkers shudder). It’s a style meant to make a happy statement and put a smile on visitors’ faces. The one place you NEVER want to drive a screw (well, other than your finger). 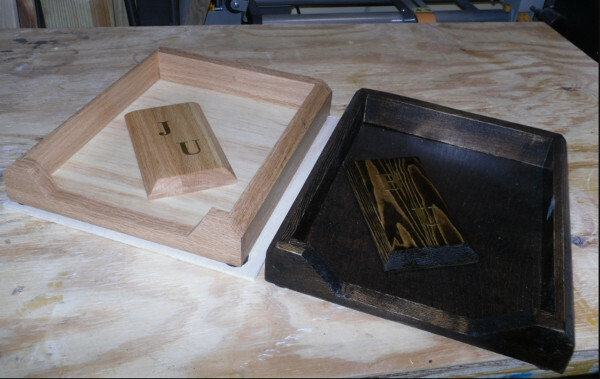 Most people start their woodworking journey only thinking about the function of their projects. We think that form and style are some higher level concepts unlocked only by woodworking gurus with years of experience. 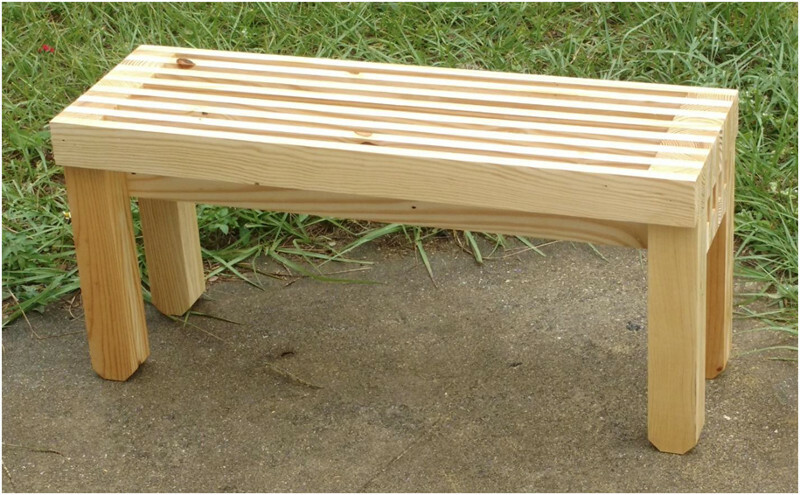 With the Harmony Garden Bench, I will show you how to develop a sense for style and form quickly and easily. The important (and very real) difference between types of screws. Yes, it matters – I’ll show you what screws you need to use. 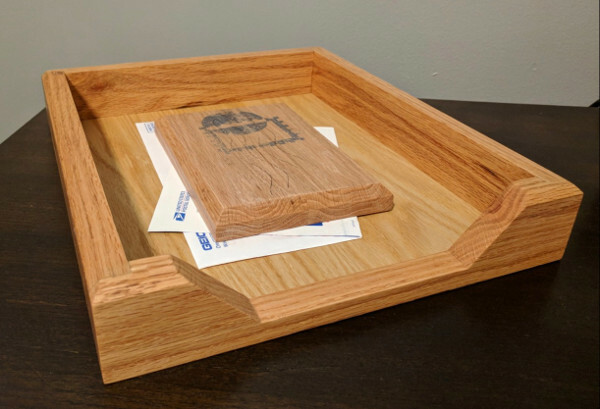 The Extra Fancy Office Paper Tray is the first table saw project of the course, and it introduces you to a lot of fundamental techniques and joinery you’ll go on to make great use of. Sidenote: Once your co-workers see this on your desk, you may want to start taking orders. Sell these for 50 bucks a pop and everyone will start to feel like an executive in that fancy pants corner office! An often-missed step that takes an “ok” finish and makes it look professional instantly. In the second half of the course, we’ll step up our game and build furniture that can take pride of place inside your home. 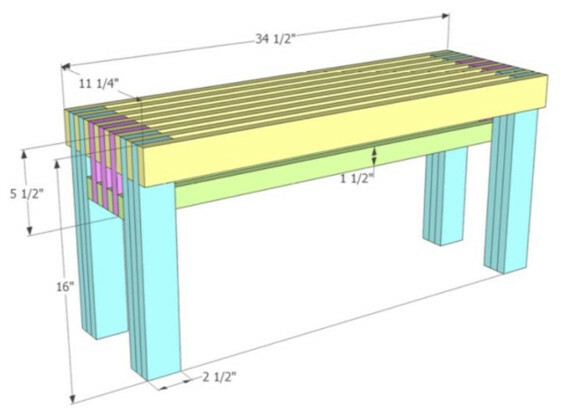 Building the Sonoma Vineyard Coffee Table, we’ll refine the skills we covered in the first three projects. 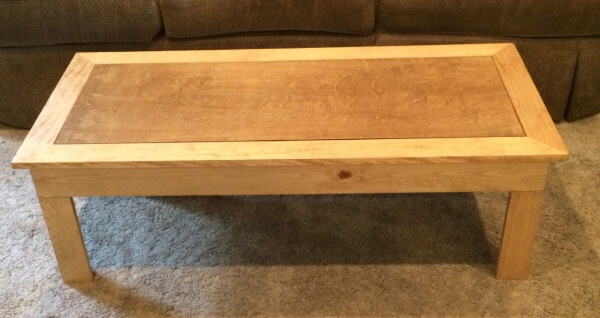 I designed the Sonoma Vineyard Coffee Table to reflect the rural yet contemporary nature of the Sonoma Valley and its hundreds of vineyards and wineries. On one hand, this table has a quaint feel with its two earth-toned shades of wood. A favorite technique I use every time to make sure my cuts are lined up perfectly. 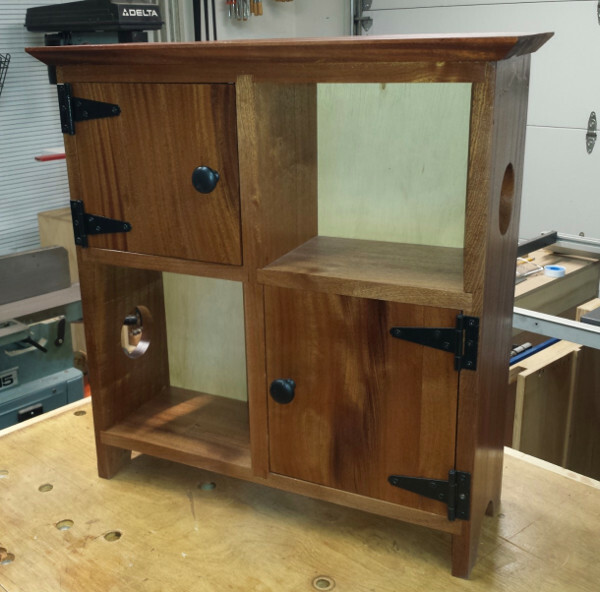 With this project we enter the world of cabinet-making and learn some traditional and timeless skills that will come in handy for all kinds of future projects. 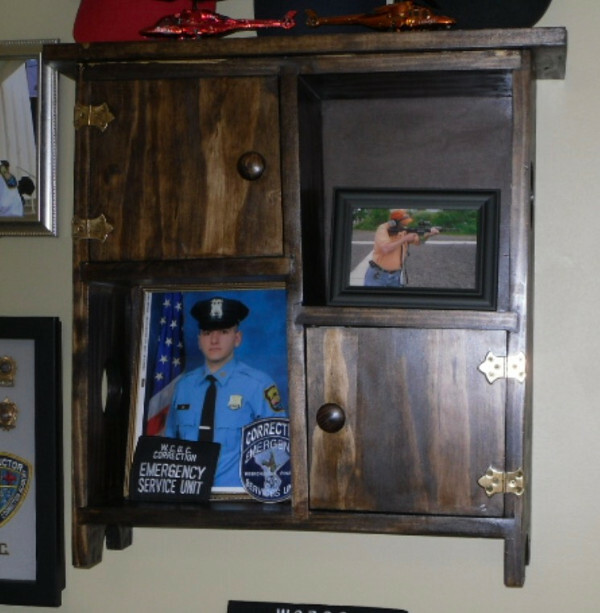 The Parlor Bookcase is a great height for any room and all three shelves are adjustable. And I’ll show you how to create a beautiful satin finish that will have people oohing and aahing about your fine woodworking skills. My mere mortal top-secret technique for the ultimate awesome satin finish (it's extra fancy AND super simple). 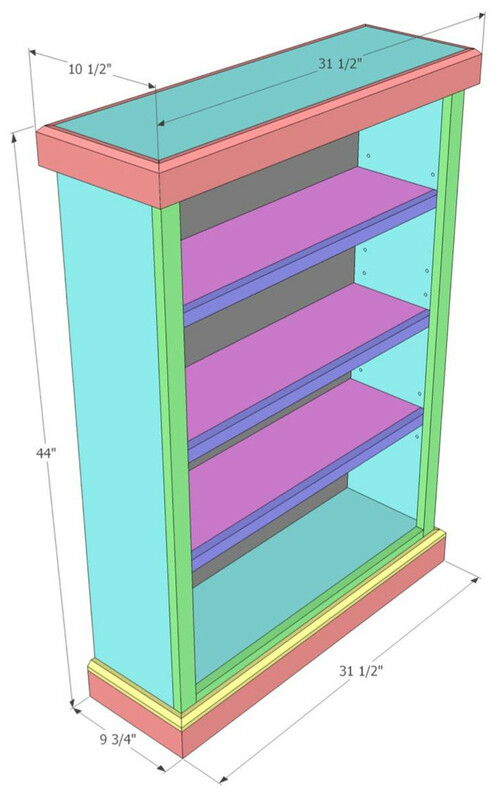 For our final week of the course, we’ll be developing our cabinet-making skills, and learning some new decorative techniques to make a stunning, professional wall cabinet. This project will refine the skills you’ve learned so far and teach you some new techniques. 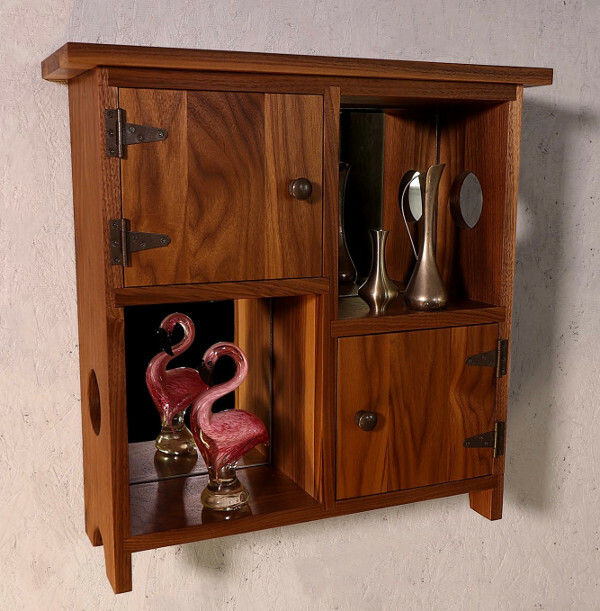 This Cabinet is named for Catalina Island because, like the island, it’s simple yet stylish and refined with plenty of room to add your own flair. 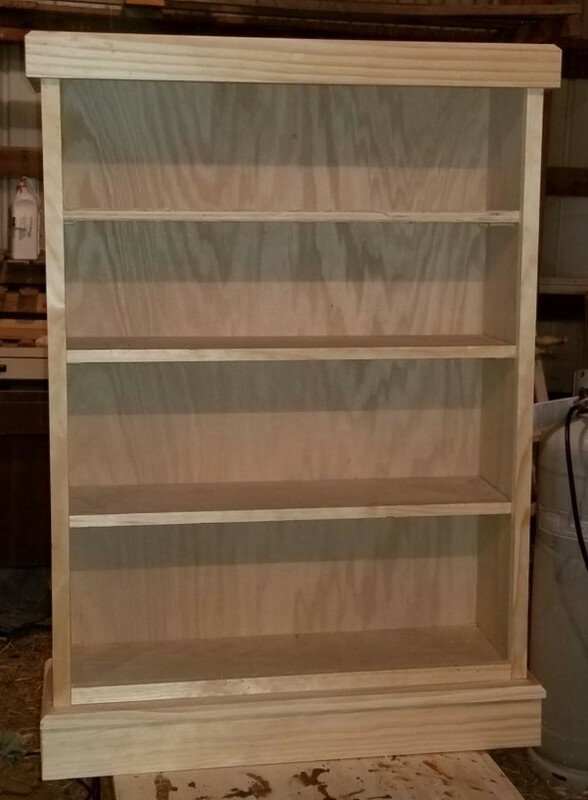 There’s lots of room for customization with this project, so you can really make it your own and show off your handiwork. Your friends will be amazed! The handy tool you’ll wish you knew about years ago that makes spray painting so much easier. 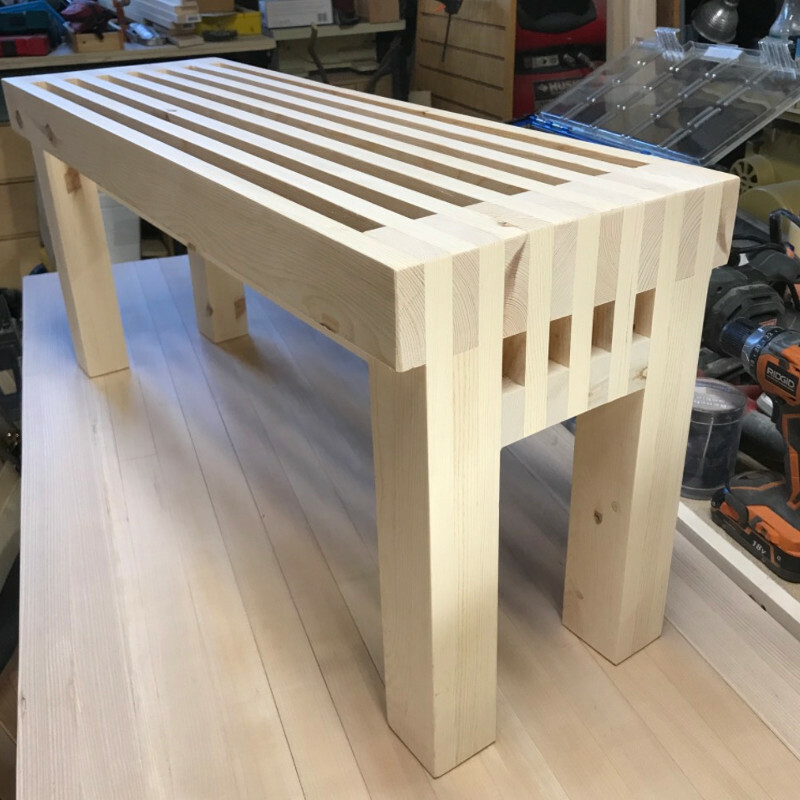 A workbench is the heart of any workshop, because we all need a sturdy surface to work on. 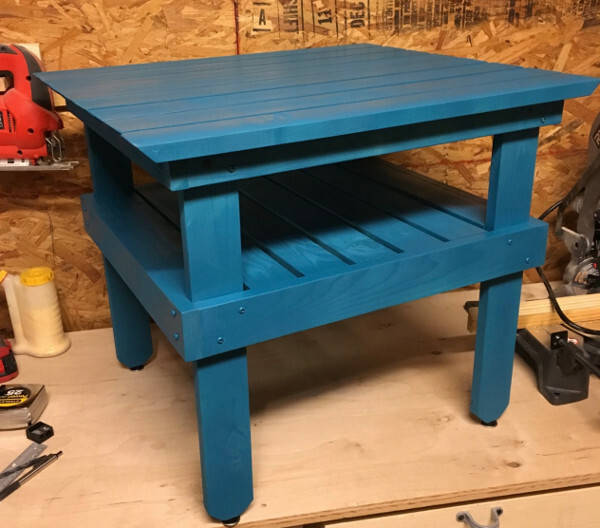 I’ve included this bonus project as a space-saving, rough-and-tumble workbench that you can (of course) build in a weekend. 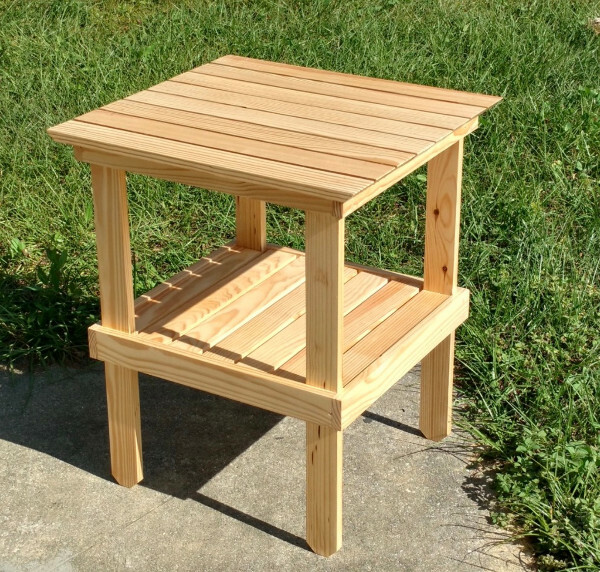 And nope, you won’t need a workbench to build it. Even if you already have a workbench, take a look at the BMW. It’s a serious workhorse that I designed to be highly customizable. 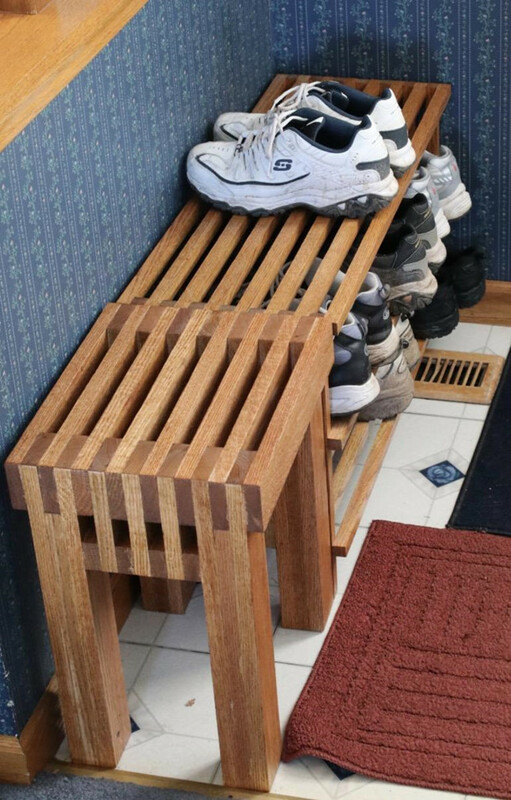 Consider making this style if you need a second bench or tool stand. 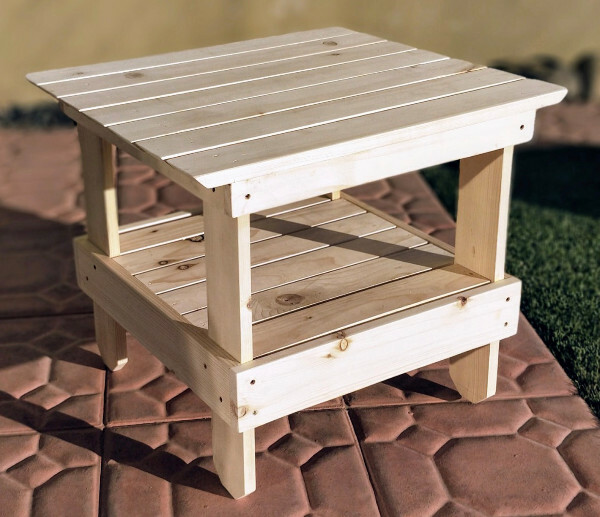 This one won’t take you long to make, and if you’ve never built anything in your life, it makes a great first project. Value: $97 - Yours FREE! 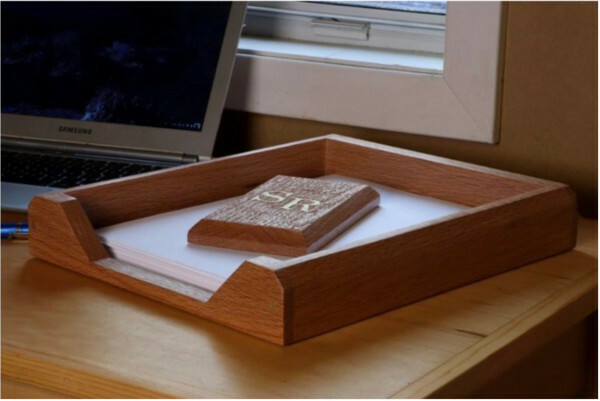 At the completion of this course, you’ll have 6 fully-finished woodworking projects, PLUS the skills and know-how to complete an infinite number more. With my How to Read Plans Training, you’ll understand exactly what the guides mean for every project. 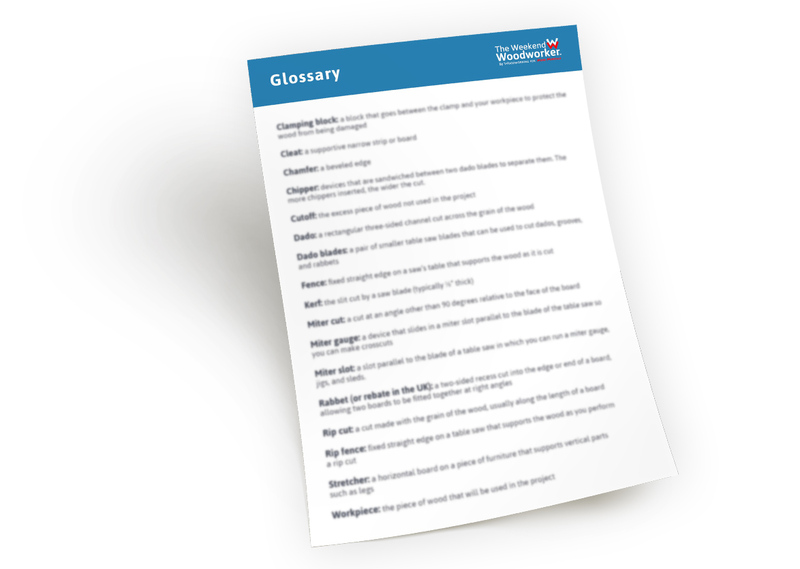 Plus, you’ll get the Woodworkers’ Glossary so you’ll understand anything I say (well… anything I say about woodworking…) as well as clear definitions of confusing terms you may have come across in other plans, books, or videos in the past. If you've ever gotten stuck hearing about counter syncing and chamfering and found yourself reaching for a dictionary when you should have been building, fear no more! Value: $67 - Yours FREE! 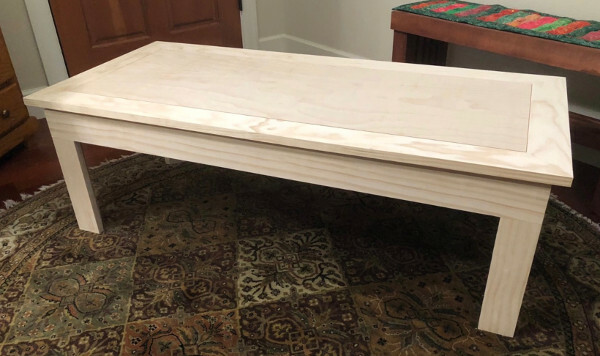 Offset the cost of your materials, try cool projects that you might not have use for, or just make some extra cash with your woodworking. I’ll dig into how much to charge and where you can sell them, locally or online. 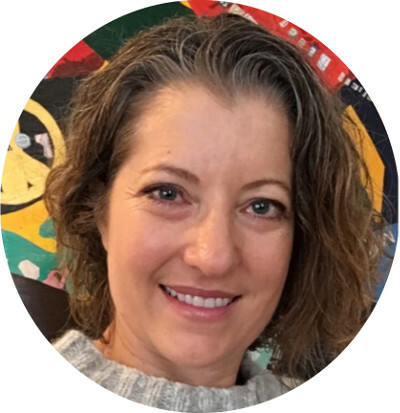 Plus, I’ll save you a ton of frustration by revealing which projects actually sell and how to research trends online using Google, Pinterest, Etsy and other sites. Value: $47 - Yours FREE! If you're not blown away by the program, and it doesn’t show you exactly how to become a Weekend Woodworker, I'll refund you 100%. No questions asked. Cancel with a 100% refund within 30 days. "So thankful for this course! To everyone who is on the fence- do it! 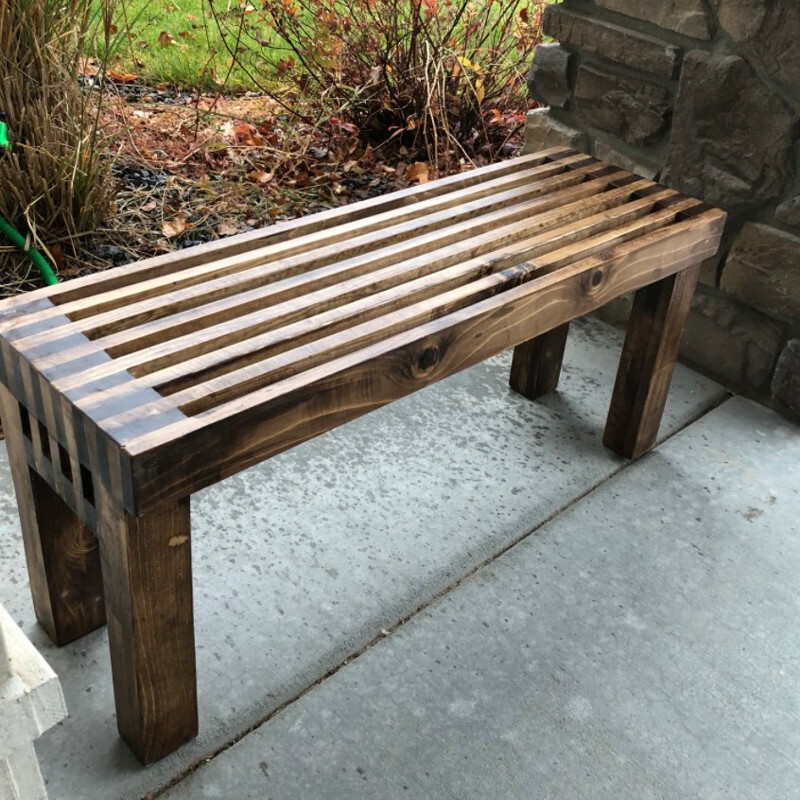 It has given me so much confidence in building wood projects and has the side benefit of adding some awesome furniture to our home. I've learned some great techniques that have brought my skills to a new level. 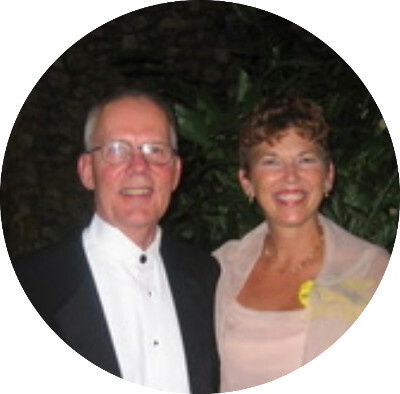 This course is definitely worth the investment." “I have a new lifestyle!!! Woodworker. Joining this class was as epic as the day I went into the military. Life altering. It's some of the BEST money I've EVER spent!!! Worth every penny and then some. I would recommend the class to any of my friends." 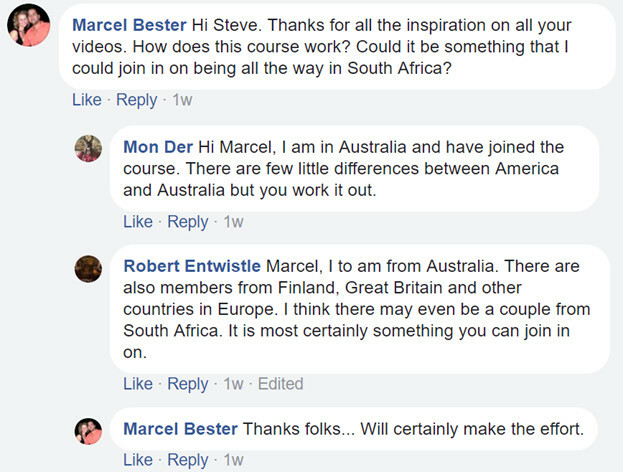 "It’s an incredible course! As a lifelong student of many things, I have to say this is one of the best-designed courses on any topic I have ever taken. I would also rank it as one of the best values of any course I have taken. Thank you for creating it. You did well!" "I highly recommend this course. 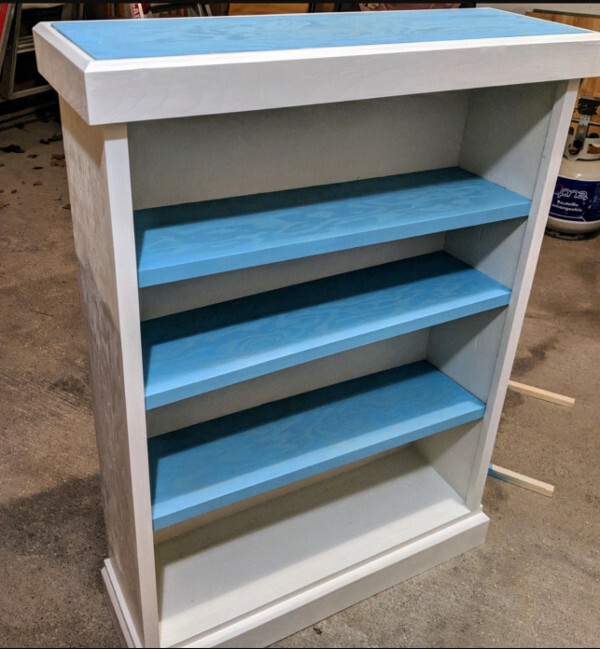 I can build things now that I never thought possible for me to do and make look good. Steve is a great teacher and really spends time covering the fundamentals. I was looking at some local classes and the cost for this class plus the materials for all 6 of the main projects is less than I would have paid for just one of those, and I can do this on my own schedule. 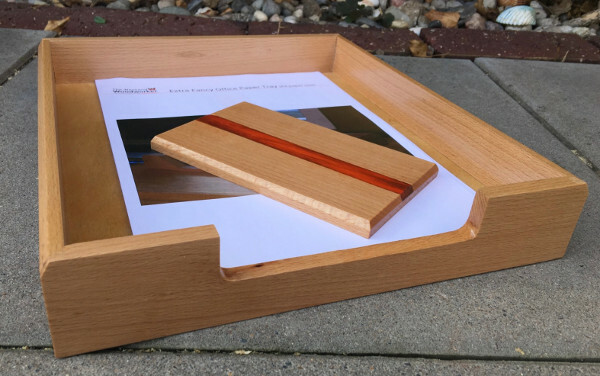 It's an excellent value and very comprehensive for a beginning woodworker or someone like me who had some tools and skills but needed to learn the methods, best practices, and precision to give me the confidence to tackle more advanced projects." "To those of you who are considering taking this course. It is well worth the cost. 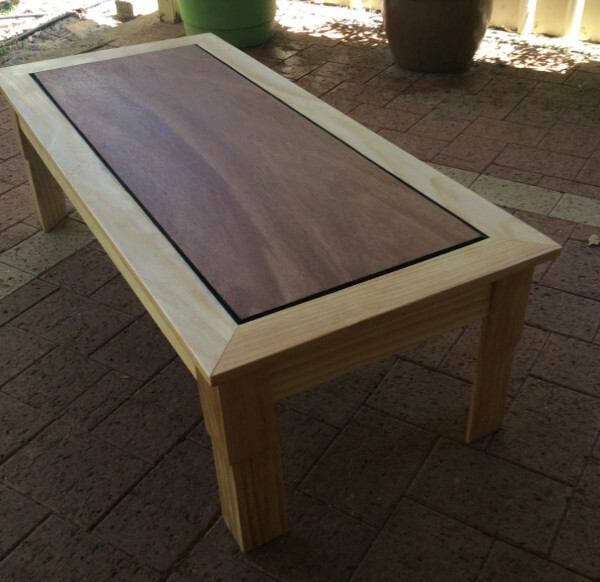 I am one of the novice, wannabe woodworkers Steve mentioned. All I can say is. If you have wanted to get into woodworking and didn't know where to start, this is the course for you. Further, from what I've heard from my classmates who are far more experienced, it's been good for them too." I don’t have a workshop to build in. You don’t need a ton of space to complete the projects. In fact, in my apartment, I built furniture on the rooftop of my building. A small backyard, basement or garage will do for all the projects in the program. 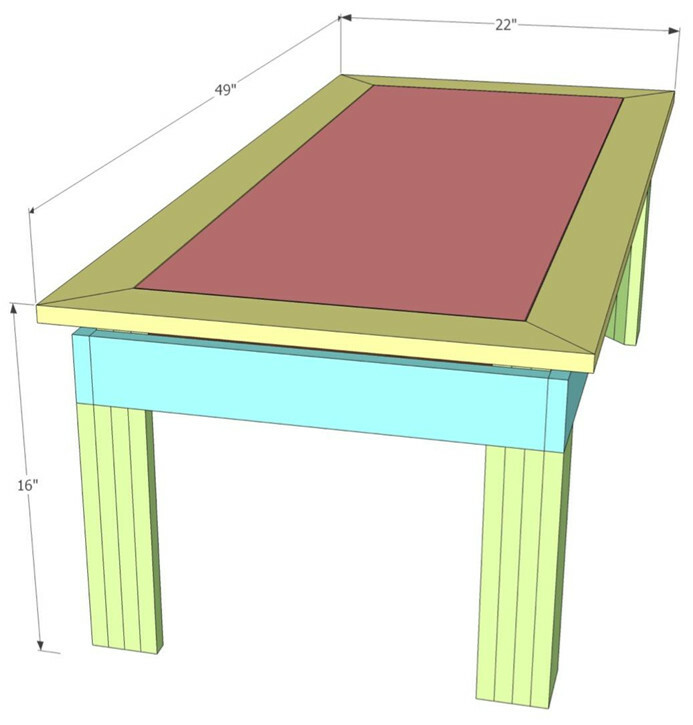 And the workbench you get to build in the course takes up less space than a lawnmower. What if I have ZERO tools to start? In the first module, I list all the tools you’ll need to get started, as well as my recommended brands. You can get all the tools you need for the course, brand new, for less than $1000 total. I also share ways to scour garage sales and flea markets for used tools. I’m afraid I can’t afford the lumber and materials for the course. You’ll have lifetime access to the course, so you can work through it at your own pace, watching the projects now and then building them when it suits you – so there’s no need to buy all the lumber and materials within the six weeks. There will be weekly material costs, but in total for all six projects, these shouldn’t come to more than a couple hundred dollars. In the course I also cover ways to save on materials, and even include a bonus module on how to make a bit of money on the side selling your creations. 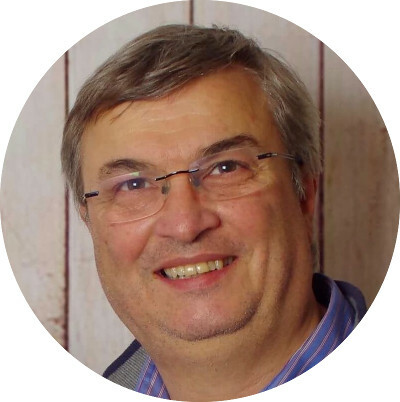 The course is divided into an introductory section, the BMW and six main projects, video extras and the bonuses (extra plans, how to sell your projects, the Woodworker’ Glossary). For each project, there is a video and step-by-step guide for each day, plus in-depth breakdowns of each skill including close-up photos. What are the 15 bonus plans? The 15 bonus plans are divided into three sections: shop projects, home furniture and gifts and toys. 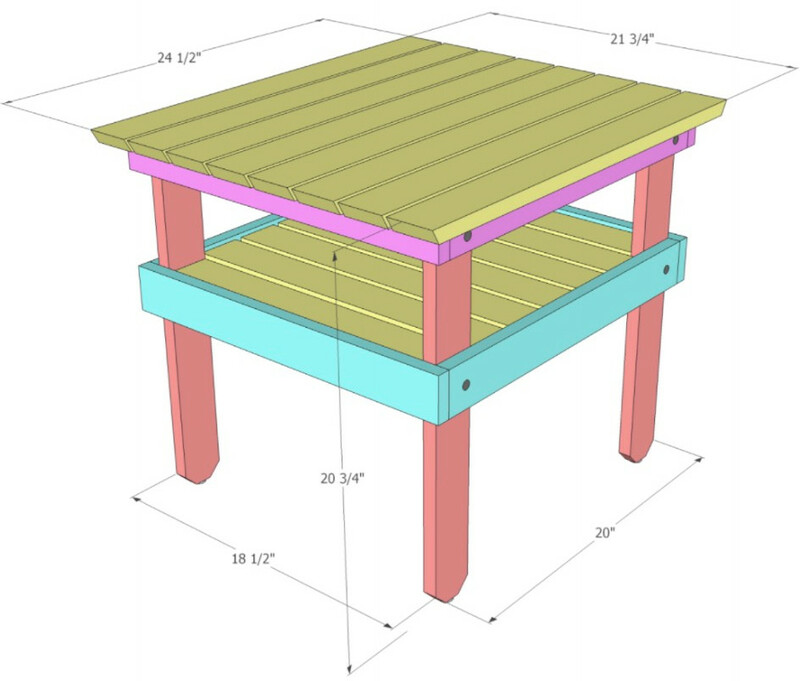 Each bonus project has PDF and SketchUp plans (with both U.S. and metric measurements). 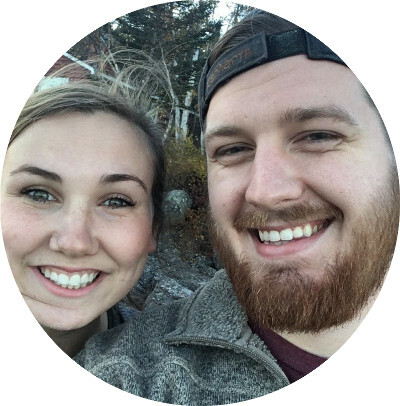 Is it a follow along or self-study course? 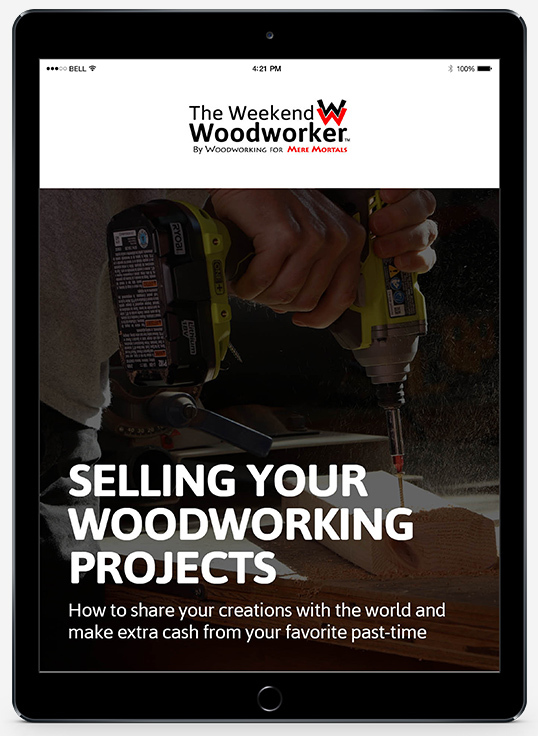 You will get all the guidance to build each project in the course videos, as well as learning how to think like a Weekend Woodworker so you can go on to build anything. At the same time, you have the freedom to customize the projects as you go. 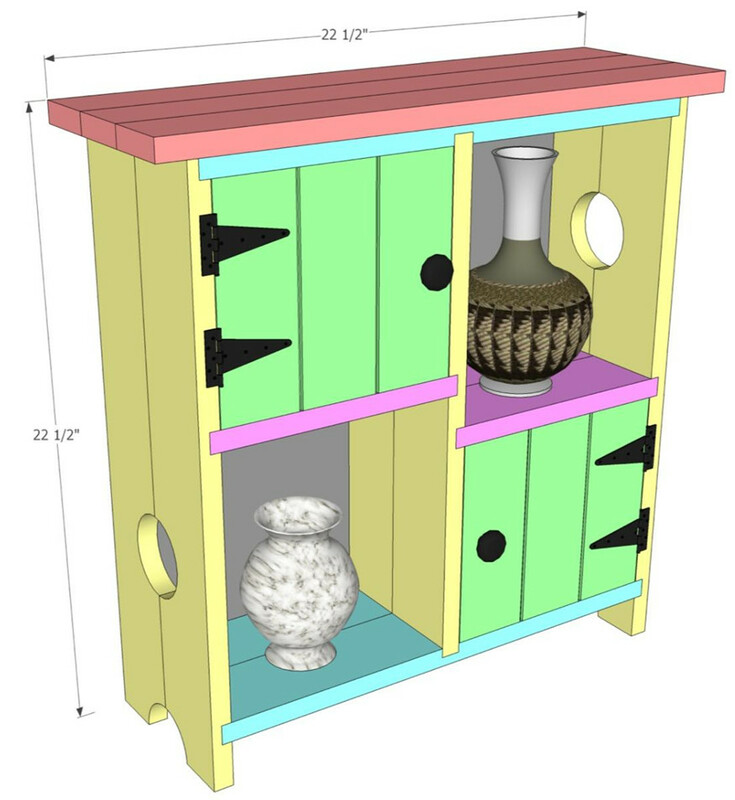 I’ll give you tips of how you can make your projects Extra Fancy, as well as showing you various decorative techniques and different options for customizing each project. 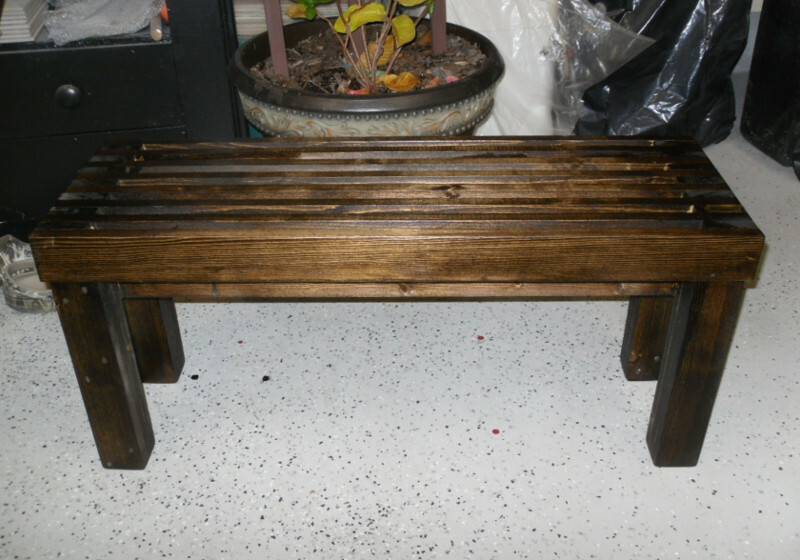 Robert customized the Harmony Garden Bench to fit in his entrance hall. As the projects are released, you can follow along and build each weekend, or take as much time as you need. It’s too cold where I live to build anything. What should I do? This is a tough one, and one I don’t have to deal with here in California. 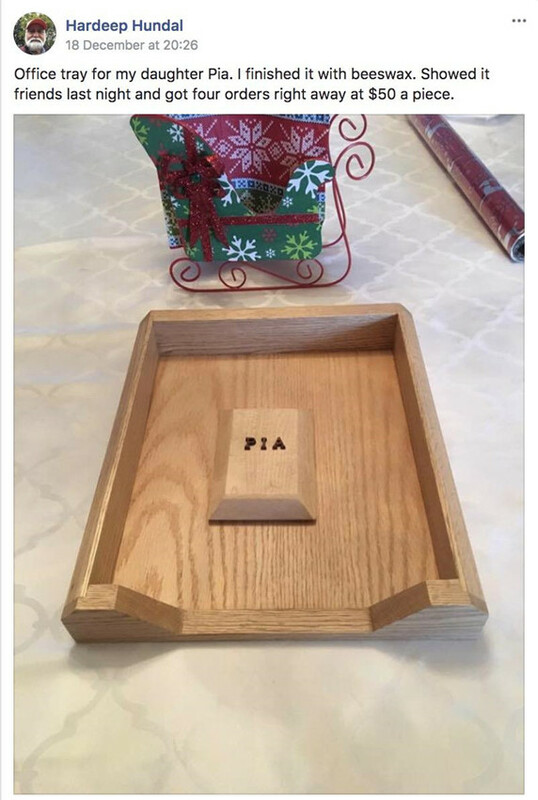 But, this is one of the reasons you have lifetime access to ALL the videos, plans, tool lists – everything, when you join The Weekend Woodworker. You can watch the videos now, get ready and once it gets a little warmer you can start building (plus take advantage of all the discount tools and lumber after the holidays). What projects are going to be in the course? If you scroll up the page you’ll be able to see all seven projects! The course is designed for you to complete 6 projects over 6 weekends (two full days). You’ll get access to the first right away with each next project being released every week. Of course, you could complete them faster or slower depending on how much time you have to spend. You could use the course during vacations and complete multiple projects in one week. You’ll have lifetime access to all the plans, tutorials, and skills videos so you can take them at your own pace. If you look at the week-by-week breakdown you’ll also see the specific estimates and video lengths for each project. Once the videos are released, you can watch them at any time and build the projects whenever you like, so there are no time restrictions. Again, you’ll have lifetime access. Will this still work for me if I live in Australia / Canada / Brazil / Germany / ...? Yes! Aside from availability and price differences for tools, The Weekend Woodworker course will still work for you. 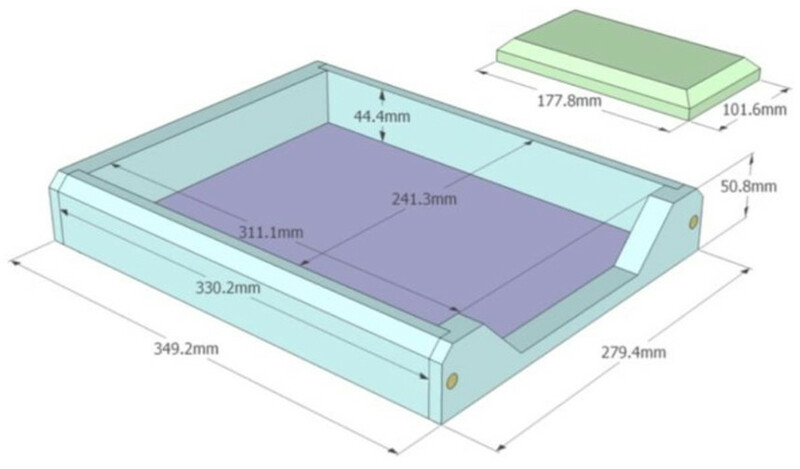 All projects come with plans in both imperial and metric measurements, so you should have no problem following along with the course. 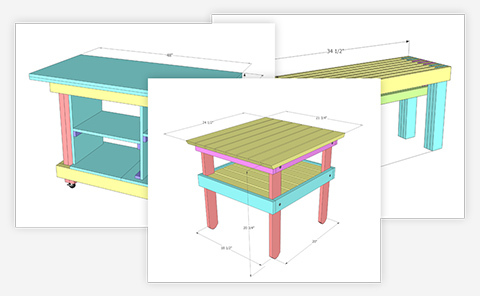 You’ll get instant access to the complete bonus project – the Basic Mobile Workbench. No waiting for DVDs or books in the mail. 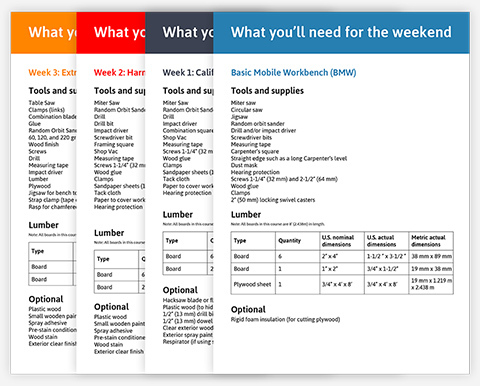 Each Monday you’ll receive the next weekend’s project and all of the plans, instructions and supply lists for it. You’ll also get instant access to all the lumber and material lists for the whole course (so if that lumber yard is kind of far, you only need to make one trip!) and my bonus guides and glossary. You have lifetime access to the course. This means once you're enrolled you will be able to access all the videos, PDFs, plans and lists forever. Do I need a router for this? No! 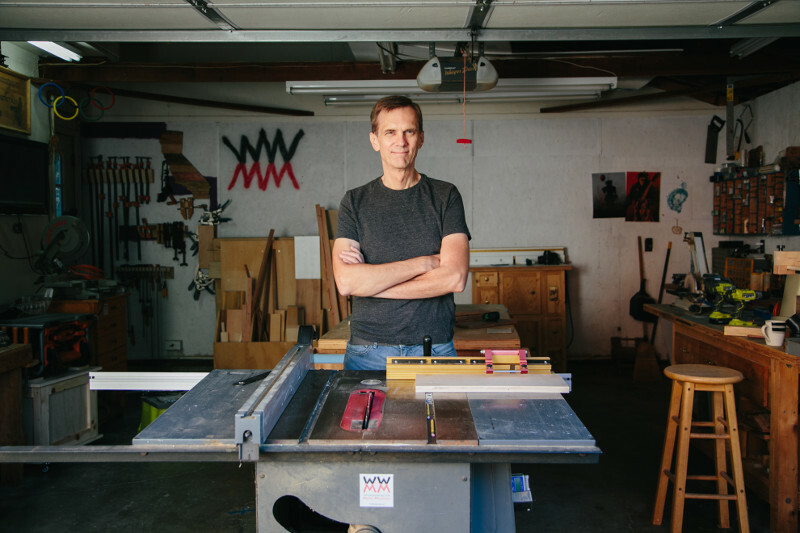 No router required at any point in the course – all the tools you need are listed in my tool guide. My table saw doesn’t accept dado blades, will I still be able to make the projects? Of course! Many members from the first group have already sold a number of their pieces! Plus, I’ve included a bonus guide on how you’ll best be able to do so. I’m not offering payment plans at the moment. How is the course different to your YouTube videos? The videos are much more in-depth than my YouTube videos. I’ve slowed down the tricky steps and laid these out clearly in the step-by-step and skills guides along with the videos. Also, I’ve never taught these projects on my YouTube channel before. Can I ask you questions if I get stuck? The course is so detailed that you’re unlikely to have any question I haven’t answered. 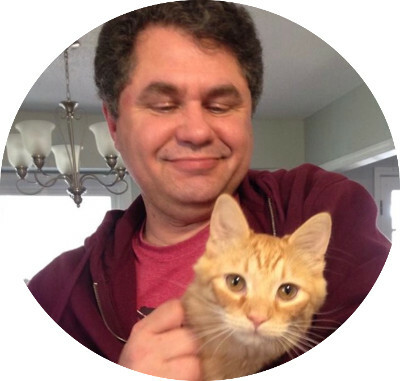 I took questions on every project from the first group to go through the course and have included my answers in a special project Q&A section, leaving no question unanswered. I’m hard of hearing. / I have a hard time understanding Steve. / I have a hard time understanding English. Don’t worry! All project videos come with English captions. So if you have any problems hearing or understanding me you can simply read along. What if I just stink at this stuff? 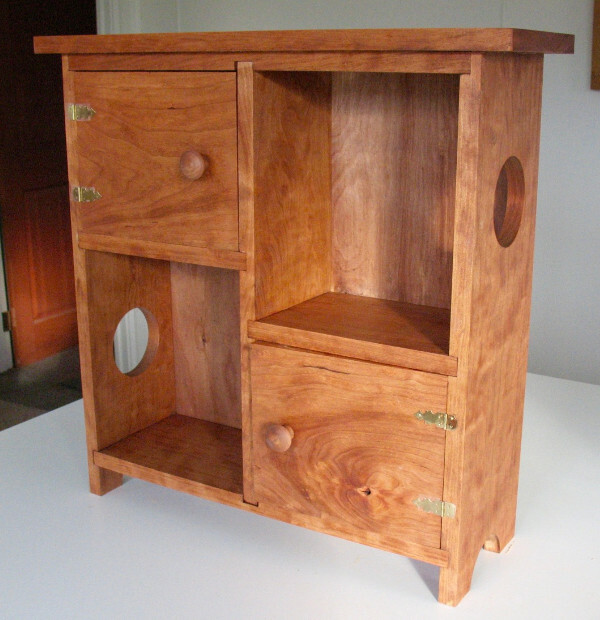 I truly believe that anyone can do woodworking. The thing is, it's just a series of steps. So, if you're able to do one small step: “I can cut a board in half.” Then it's not that much of a leap to take that board and attach it to another board. Once you've got that, there are few things you can’t do. And to me, that's part of the appeal of woodworking. Ultimately, it's simple. There's really nothing complicated about it. 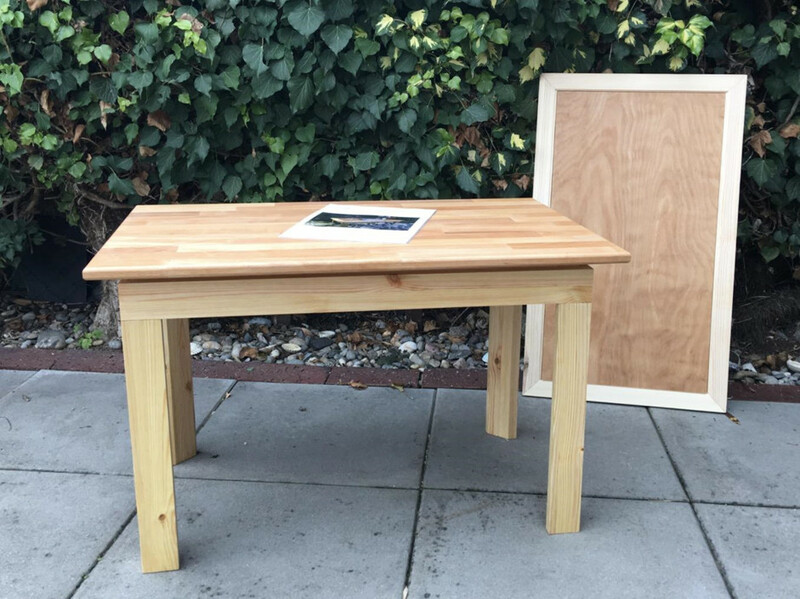 Even $10,000 furniture is ultimately simple to make. It's just got a lot of steps to it. Together, we’ll work through it. One step at a time. And if you find it’s not for you, that’s ok, too. 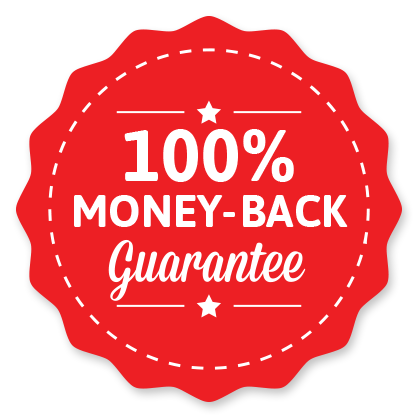 I offer a 100% money-back guarantee.